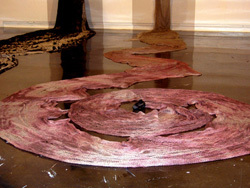 Carol Shaw-Sutton's artwork often consists of personal narrative objects and installations utilizing both ancient and more modern textile techniques that require a labor-intensive commitment of focus and time. Their goal is to simultaneously value and at the same time, transcend the notion of time and space. 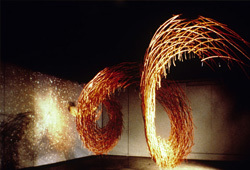 In a visually poetic language they deal with deep human concerns for harmony and release through the body and spirit. 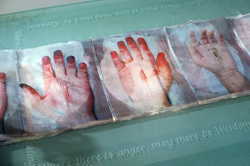 Counting, longing, journeying, scarring, repairing, caring, crossing and empathy have become recurrent themes in her work. Many years ago she saw an exhibition, at a convent in France , of the personal effects of the nuns living there. She was particularly stuck by the beauty and simplicity of the materials, care given in their construction, and their very humble, yet profound sense of personal history. Each nun received one set of linen sheets to be used and re-used for her entire lifetime. Through time, often twenty to forty years of use, these pieces of fabric took on the imprint of their owner's very essence. Stains, repairs, and the thinning of the fabric itself touched the artist in a palpable way and those images have stayed with her. As human society becomes increasingly complex, and paradoxically both alienated and interdependent, the interwoven language of textiles can stand in as a potent visual metaphor. In aspects of scientific String Theory to and Interdependent Global Economic Markets , the constantly moving and connective nature of fiber can help us to understand the expanding matrix of the field surrounding us. 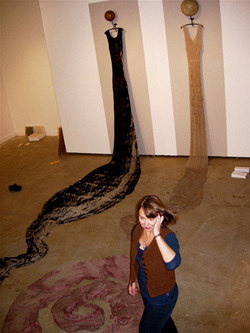 Her work has dealt with expandable and accumulative structure from the beginning. In her newest work she is focusing on our inter relationship to each other and this is reflected in images of the human form as organic flowing substance.